This July I can attest to the fact that we have well and truly been pulling our weight in the Archives and Collections. 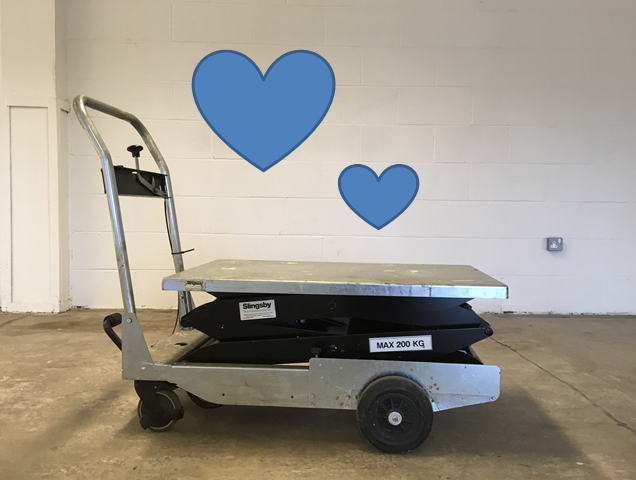 In fact, with the help of our trusty hydraulic trolley, the Slingsby, we’ve quite literally been pulling some serious weight whilst escorting some of our heaviest collections to a glamorous photo-shoot with Art UK. 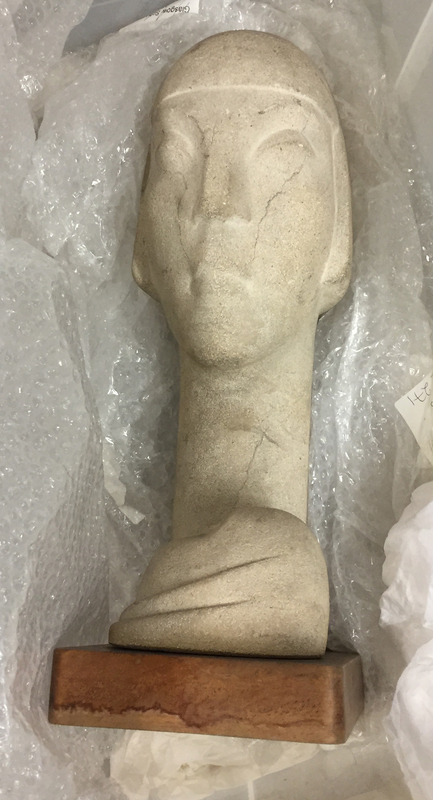 GSA Archives and Collections have already benefited from the work of charity Art UK. As part of the charity’s mission to make public art more accessible, they previously digitised a number of our paintings and made them available on their website. 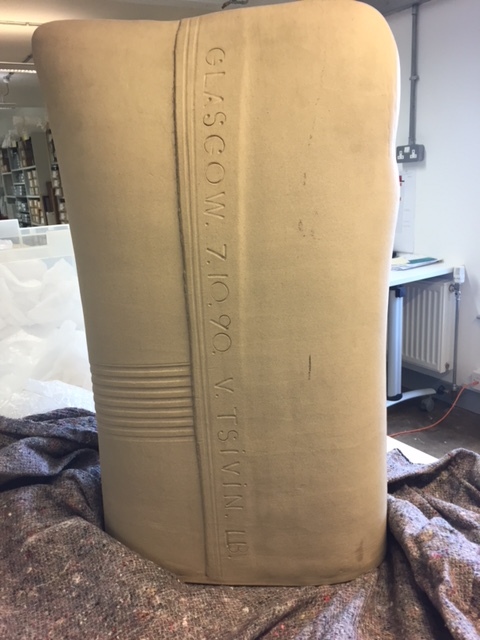 This time Art UK were visiting The Whisky Bond to digitise some of the sculpture from our collections, as well as those held by the Royal Conservatoire Scotland Archives and Collections. Digitisation Preparation Point 1 – Collect your information! Our preparations for Art UK’s visit began weeks ago when our Support Assistant, Kay, selected the appropriate items for digitisation and collated background information and relevant metadata on each. These will be published on the Art UK website. Digitisation Preparation Point 2 – Use a hydraulic trolley to gather heavy items together! Some of our sculptural pieces are heavy and bulky. This is when we realised the value of the hydraulic trolley. We slid the boxes containing the items onto the raised platform and so avoided lifting weighty objects from a height. Digitisation Preparation Point 3 – Document the movement of items! 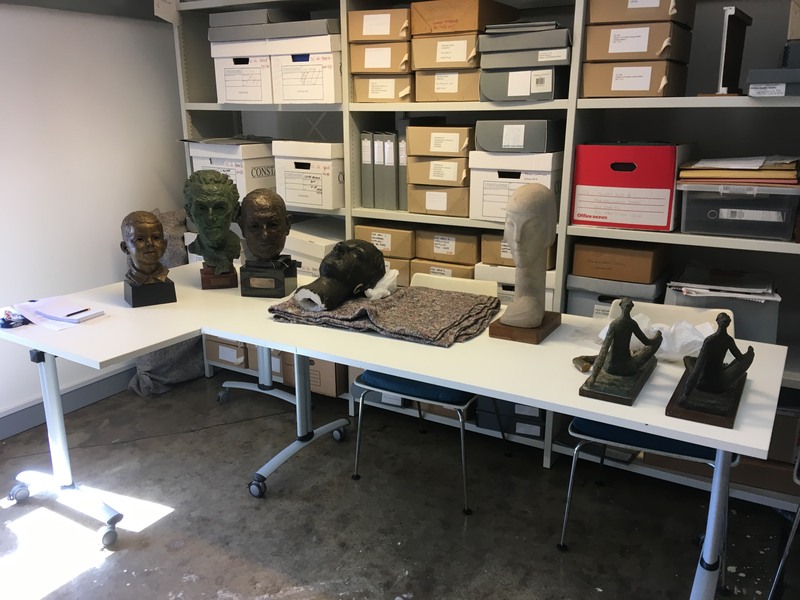 Of course we were sure to document the fact that the items had been removed from boxes, as well as leaving ourselves records of where and how they had been stored. This ensured an easier re-shelving. Digitisation Preparation Point 4 – Practice handling the items! We then proceeded to un-wrap our items and assess how best they could be removed from their boxes and handled thereafter. For each item we developed a different approach, as the sculptures differed widely in nature. Looking at the individual features of each, we identified potential weak areas and the most secure and supportive ‘handholds’. We also discussed where we were going and how we needed to move, (for example if the item would need to be rotated or tipped). During this activity you may find yourself sounding like the Chuckle Brothers. This is not necessarily a cause for alarm. Digitisation Preparation Point 5 – Prepare items to be photographed from largest and heaviest to smallest and lightest! When Art UK arrived and were ready to commence with the GSA photoshoot, they set up their studio – it was brilliant, portable and simple. 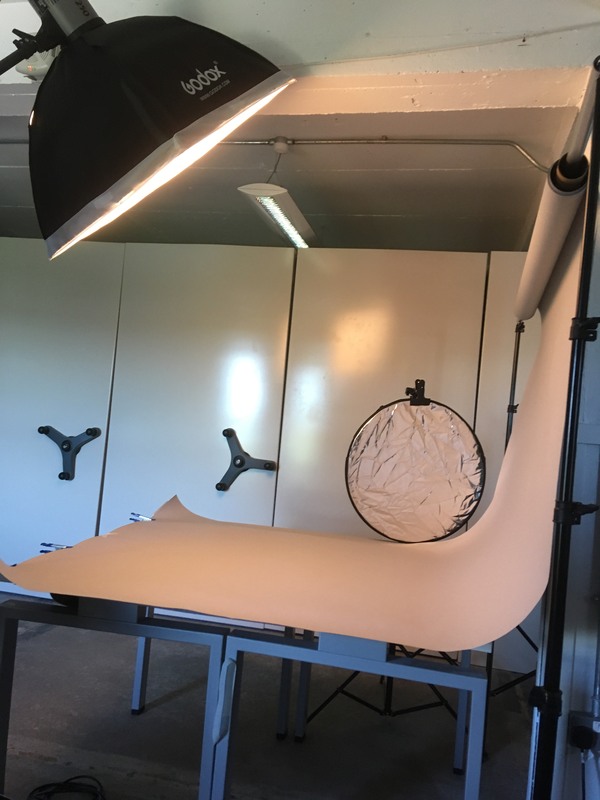 A roll of grey paper held up on a pole between two tripod-like stands, a soft box and camera on a tripod with a remote trigger. The paper pulled down to form a continuous backdrop and base for the items. 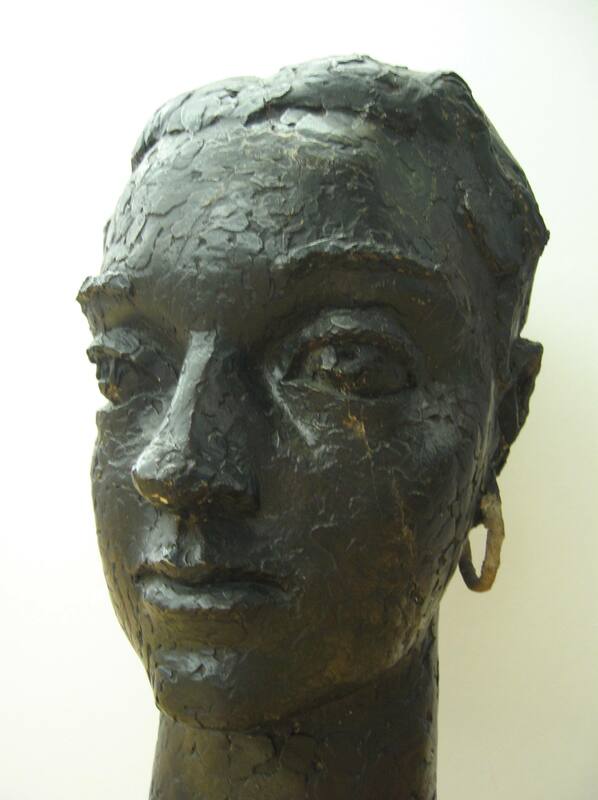 Smaller items were photographed first, as these were less likely to mark or damage the paper. At the end of the shoot, the paper can be cut off and a fresh piece pulled down to replace it for the next shoot. Digitisation Preparation Point 6 – Put the brakes on (and the lights off)! Our studio area was simply a table against a wall. We soon realised that if you have tables on wheels, it’s a good idea to ensure the brakes are on! The same, naturally, applies to the trolley. 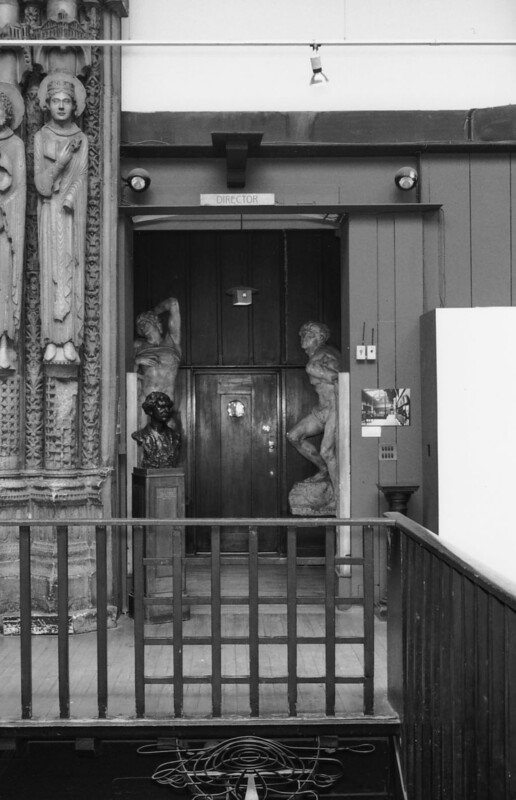 The blinds were closed to allow complete control of the light on the sculptures. It was then a case of implementing what we had learned, and moving the items on and off the table as efficiently as possible. Alan and Freya from Art UK were brilliant – happy to share their knowledge and passionate about their jobs. 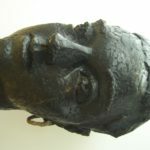 Cat was not afraid to be involved in the process and assisted Alan by holding a reflector – changing the angle to best reflect the textural qualities and details of the sculptures. Each item was photographed from six different angles, with Cat or myself assisting in rotating them between shots. Digitisation Preparation Point 7 – Clear the decks and the diaries! As the day drew on, I grew concerned that we would run out of time, knowing that we had left the most difficult items to move until last. 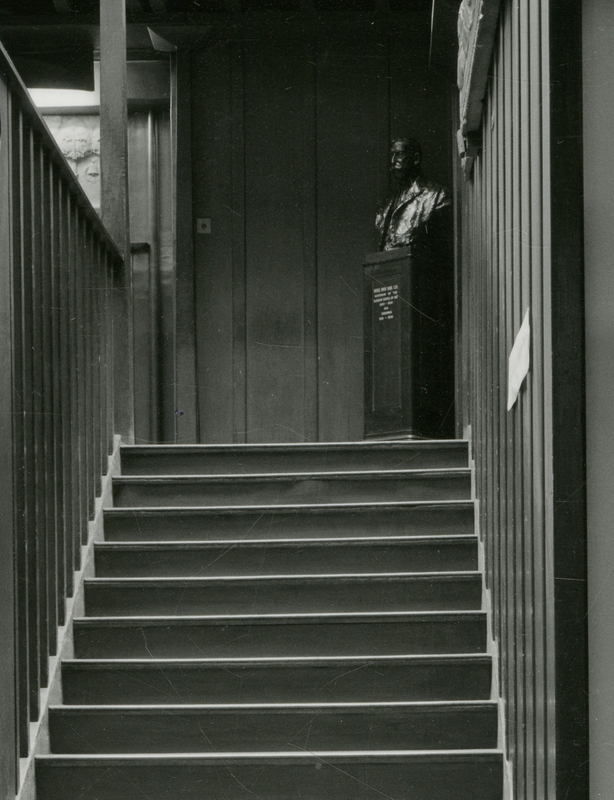 If you visited the Mackintosh building when it was in use by students, you might recognise these two sculptures of Francis Newbery (NMC/270) and Patrick Smith Dunn (NMC/262). They now sit on either side of Cat and myself, welcoming visitors into the archives. 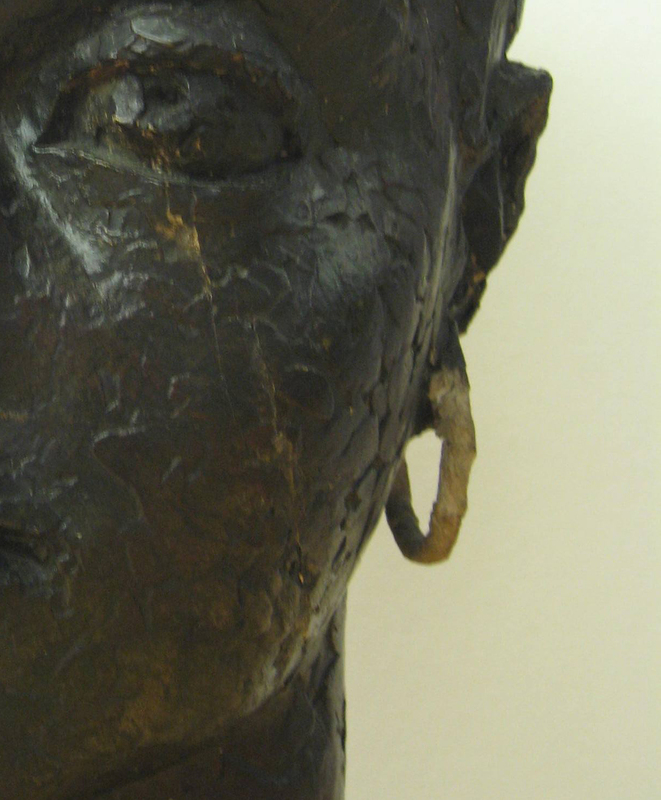 Made of solid bronze, and sitting on plinths so that they meet your gaze at eye level, these gentlemen were more problematic than the others to move and photograph, so were left in their respective homes until we could make a decision about how to do this. 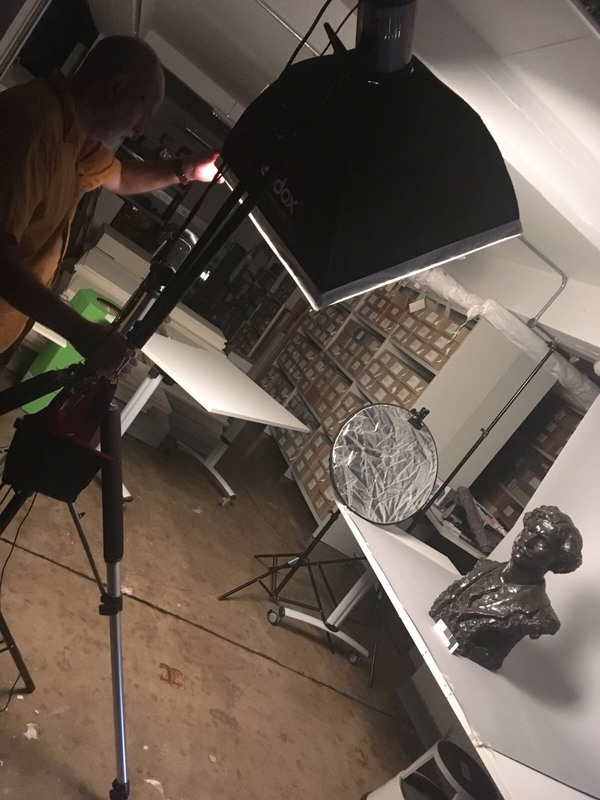 It was eventually decided that it was possible to move them through to the photography area by employing great care, the hydraulic trolley and the help of our Cataloguing Archivist, Rachael. Luckily we had cleared the diary for this day. This meant that no visitors were uprooted or disturbed as we shifted furniture and prepared to cajole Newbery through the space. Which brings me to Digitisation Preparation Point 8 – have colleagues on standby! The smooth transfer of Newbery and Dunn was only made possible thanks to the efforts of our team and Art UK’s Regional Digitisation Manager, Hazel Buchan Cameron, who joined us for some of the day. Their willingness to assist as time ran out was invaluable. As you can see, the day was a learning curve. It might sound like a cliché, but I really did find that teamwork was the key to success. The willingness of all my colleagues, as well as Alan, Freya, and Hazel to do their upmost and share their experiences made for a rewarding and successful day. Special thanks goes to Slingsby the Hydraulic Trolley without whom none of this would be possible.